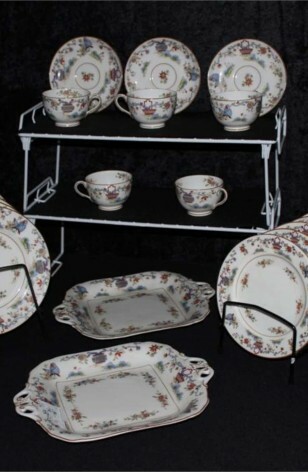 Antique - Royal Worcester China, Made in England, the "Pekin Pattern produced in 1912. A Set of (20) Pieces. This is a very Old Highly Sought After Pattern that Rarely comes to market. The Background is a smooth Cream White, with a beautiful Chinese Basket and Flower Vase Pattern. The Back Stamp for Royal Worcester Dates from 1910 to 1912 only. Each Piece is Trimmed in 22kt Gold, and he Plates have a 22kt Gold Verge. 3 - Saucers - 5 1/2"
5 - Bread/Dessert/Tea Plate - 7"
5 - Luncheon Plates - 8 1/4"